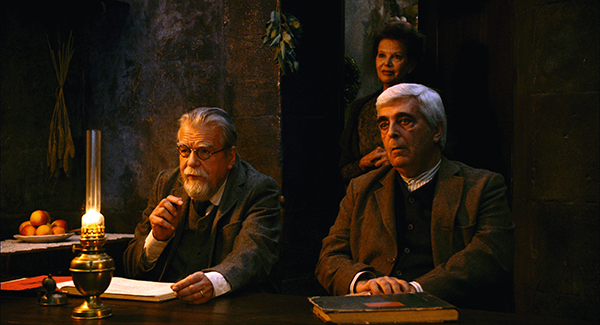 In an interview published in the Venice film festival press kit, Manoel de Oliveira tells the story of how he came to adapt the theatre play Gebo and the Shadow. A friend asked Oliveira why he hadn’t made a film about poverty during the current time of economic crisis. Oliveira replied that such a movie would be difficult to make, unless it was a documentary. Despite this difficulty, the idea of a film about the crisis had not vanished entirely from his mind, and it was then that Oliveira remembered the four-act play written in 1923 by Raul Brandão (1867-1930), an outstanding playwright born in Porto, whose work is virtually unknown outside of his home country. Brandão is a rare case in Portuguese literature: influenced by the decadent symbolism of the late 19th century, his writing is littered with nightmares and cursed, hideous creatures, mixing evolutionism, mysticism, anarchism, and Christian-prophetic messianism with a poetic intuition that tends to hallucination. His characters often appear charged with dreams and woes, and testify to literary reminiscences that come from Brandão’s readings of Tolstoy and Dostoevsky. It should be added that if Oliveira’s friend’s remark was intended as a provocation, it was not an entirely fair one. Although most of Oliveira’s work tends to portray the privileged classes, Oliveira entered the cinema more than 80 years ago by filming poor, working-class men in Douro, Faina Fluvial (1931), which was certainly the documentary that Oliveira had in mind when he was talking to his friend; likewise, downtrodden Porto children were the subjects of Aniki Bóbó (1942), his first feature. Oliveira returned to the life of the poor when he was reborn as a filmmaker in Rite of Spring (1962), an adaptation of a popular Passion play filmed in northern Portugal, as well the extraordinary short film A Caça (1963). The Box (1994), another adaptation (of a play written by Prista Monteiro), focused on the alms box of a blind man (Luís Miguel Cintra) who lives in a poor Lisbon neighbourhood; this film, a caustic operetta about charity, recalls in a certain way the characters of Gebo and the Shadow. (One of Oliveira’s regular collaborators, Cintra was responsible for the staging of Black Spring, an extraordinary play based on texts by Brandão, presented by Lisbon’s Teatro da Cornucópia in 1993.) And how does one not think about money when poverty knocks on the door of Macário, the accountant played by the director’s grandson, Ricardo Trêpa, in Eccentricities of a Blonde-haired Girl (2009)? The character of Gebo, also an accountant, could, in fact, be an older Macário, the same who pushes away his blonde fiancée in Eccentricities when he discovers that she has a compulsion for thievery. The same Gebo that, at the end of this new film, will assume responsibility for a theft that he has not committed, following the line of the overwhelming anguish of Brandão’s prose. Inspired by a deep pessimism that has its roots in Nietzsche and close to the theme of Dostoevsky’s 1861 novel Humiliated and Insulted, Gebo and the Shadow flees the model of the naturalistic theatre of its time and is a shining example of the Portuguese drama of the first half of the 20th century. Perhaps due to its darkness, today it is almost a forgotten play, having not been staged anywhere in Portugal for more than 30 years. But Oliveira, a Brandão reader who had never before adapted a work by his fellow countryman, had a good memory of it. The play unfolds in a single, mournful room of an old house, so cramped and suffused in disgrace that one could say there’s no vanishing point, nor any God to provide help. Oliveira respects Brandão’s minimalist theatricality, creating a clear picture of the human condition, its absurdity, and its passion for suffering. This is a theme dear to Oliveira, particularly in one of his most intense movies, Benilde, or the Virgin Mother (1975), with which Gebo and the Shadow, both in its theatrical origins and the darkness of its text, establishes an intimate correspondence. Gebo (Michael Lonsdale) is an aged, decent and broke family man subdued by routine and a sense of duty who has learned from life that “when money’s involved, no one ever forgives.” He lives with his wife Doroteia (Claudia Cardinale), a woman who does not accept reality, pushing upon Gebo and their daughter-in-law Sofia (Leonor Silveira) an endless pack of lies about their missing son, João (Ricardo Trêpa, speaking in a disarming French accent that draws attention to his character’s dubious nature). Gebo often receives his faithful neighbours Chamiço and Candidinha (Luís Miguel Cintra and Jeanne Moreau): their favourite sport is complaining, which nicely complements Gebo’s perpetual sense of hopelessness. A man without ambition, Gebo often laments: “The question is whether we come to this world to be happy.” In fact, happiness here is a temptation and a sordid object in the house: a bag full of money collected from the company where Gebo works. The shadow of the title, on the other hand, seems to be a far more complex issue. Because first of all in the film, brilliantly shot by Renato Berta in HD on a studio set, faint oil lamps are always flickering, and there is no distinction between day and night. This is a perennially dark world where there is almost no light to reflect any shadows at all: we could dare to say that colours and image here have a pictorial sense and a distinctive purpose. Secondly, because in the texts of Brandão, the shadow is a suffocating thought, commenting on the Portuguese soul and despair from the perspective of the myth of Sebastianism, a topic addressed by Oliveira in both No, or the Vainglory of Command (1990) and The Fifth Empire (2004). For a director who once said that the truth and the event are the two greatest vectors of his work, this historical approach is not an abuse of our imagination: “Today is a product of yesterday,” as Oliveira once said. But that shadow becomes even more mysterious if we just observe the characters we have before us. João, Gebo’s prodigal son, left home eight years earlier, much to the despair of his mother Doroteia, who does not know that he became an outlaw. Maybe the shadow is that amoral and disgraced son who comes back to humiliate these characters, mired in poverty, and exacerbate their misery by stealing the company money that his accountant father has in his possession. Rather, João might appear in the scenario to signify that Gebo, a man who has tried to be honest all his life, can only end his days pathetically, by confessing to a theft that he did not commit. However, we should remember that, basically, we have been inside of a ghost story since the beginning. We saw a ghost just after the opening credits, in the shot where we see João for the first time; it’s the only one recorded outside of the Parisian studio where the rest of the film was made. A young man, who we will only later discover is João, is grabbed by two hands that come for him literally out of the dark, prompting him to shout: “It wasn’t me!” Is this scene real, or a dream (or a nightmare) of Gebo’s? Just as we’re unsure whether João really exists, likewise it’s an illusion that there is honour in being poor—João’s theft ultimately destroys that ideal, violently. When sunlight finally penetrates the house, followed by the shot of a paralytic Gebo that ends the film, the idea that João might be nothing but the shadow of his own father seems to gain a new, tragic credibility. In the fourth act of Brandão’s play, the father returns home transformed and converted to the world of crime after serving time in jail. Oliveira avoided that tragic conclusion, as he halts the film at the end of the third act—which means that he managed to keep the ghosts hidden in their shadows. Perhaps that’s why the long-awaited João arrives home with an insane, grotesque laugh, saying that he’s cursed when night falls; he’s projecting the secret desire of Gebo to become the thief he doesn’t have the courage to be. In the recent modest but delightful documentary short 101 directed by Luis Miñarro, the Spanish co-producer of The Strange Case of Angelica (2011), some quotes by Oliveira are overlaid onscreen texts in the film. In one of them, Oliveira says: “The act of filming, the act of photographing, is in itself violent. Just as a murderer cannot avoid death, the director cannot avoid filming.” I don’t know exactly when and why Oliveira said that (Miñarro does not reveal the source) but the sentence impressed me a great deal, especially Oliveira’s use of the word “death”; it came to mind when I saw Gebo and the Shadow for the first time. If Gebo and the Shadow is a film about death and despair, it is no less violent in its form. The mystery of Gebo and the Shadow emerges somehow from this violence, pushing Oliveira’s concept of cinema even further, and leading to one of his most radical films ever. Oliveira could not concentrate so much suffering, anguish, and harm in a single movie if he did not have an absolute trust in his actors, a remarkable cast of established veterans (including Lonsdale, Cardinale, and Moreau) who made the director adapt the Portuguese piece into French. We can feel in the movie how tense this shooting must have been and how much Oliveira invested in his art: every shot (some of them more than 15 minutes long) is a tour de force of precision that leans toward pure hallucination. This cinematic effect, faithful to the verbal power of Brandão, creates a fatal attraction for those who accept the invitation to play Oliveira’s game. At the Viennale, while she was presenting the movie, Leonor Silveira confirmed that tension when she revealed that Oliveira, now taking advantage of HD, thought about shooting the film in one long take, an idea that was strongly discouraged by his producers. Still, Oliveira staged Gebo and the Shadow on a claustrophobic set with most shots involving six actors sitting around a table, and, as always, a tightly fixed camera. He starts from the codes of what once was called “filmed theatre,” a phrase that has been used superficially by some critics to characterize his work since Doomed Love (1978). But even in its most noble sense, the notion of filmed theatre seems completely inadequate for Oliveira, and definitely for any analysis of this film. Gebo and the Shadow, either in its options of mise en scène or in the direction of its actors, may be haunted by theatre, but it knows how to play with its masks and keep them hidden. Is Gebo and the Shadow filmed theatre? Why not talk instead of a purely cinematic antechamber of death where the ghost of reality actually fakes the truth? Oliveira is a man of doubt. Once again, he prefers to stand before the great enigmas of the human soul and avoid all judgments, because one can never judge destiny. And it is destiny that the cinema of Oliveira is all about.